^ a b c d e f g h 久米康生 1995, 和紙文化辞典§麻紙. ^ a b 久米康生 1985, p. 6. ^ Lu X , R.C.Clarke (1995). 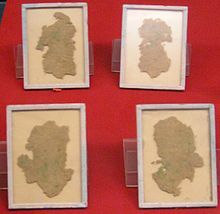 “The cultivation and use of hemp (Cannabis sativa L.) in ancient China”. Journal of the inernational Hemp Association 2 (1): 26-30. http://www.druglibrary.org/olsen/hemp/iha/iha02111.html. ^ a b 久米康生 1985, pp. 18-19、33. ^ a b c d e 久米康生 1985, pp. 34-35. ^ a b 久米康生 1995, 和紙文化辞典§色麻紙. ^ 久米康生 1985, p. 33.